Charles was born in Nobut, near Leigh, Staffordshire on 5 October 1884, the eldest child of Charles and Mary Jane Hollins (nee Slater). His father was a wheelwright and farmer. The ever increasing family moved to Upper Leigh and then to Field near Uttoxeter where they ran a farm big enough to employ all the adult family members as well as a couple of servants. Charles junior remained with his family till at least 1901. He married Dorothy Anne Davies in Stafford (where she came from) in 1906. Three children were born: Charles Thomas (1908), Dorothy Ann (1910) and lastly Kathleen Violet (1911) who was baptised in Wincle. 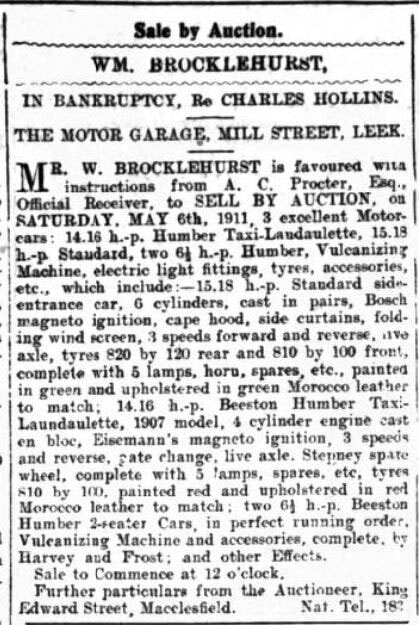 Charles worked as a chauffeur after their marriage and then set up in business in Leek as a Cycle and Motor Car Agent at Mill Street Garage on 25 March 1909. The family was living at 19 Alma Street. However, it can’t have gone well as he filed for bankruptcy less than two years later and was examined in the Macclesfield Bankruptcy Court on 30 March 1911. By August that year we can see he was working again as a chauffeur, in Wincle, most likely for the dowager Lady Annie Brocklehurst or possibly for James Jennison of Belle Vue who had a holiday home in the village. He enlisted in the army on 26 October 1915 in Manchester at the age of 31. His pension record shows him to have been a little stocky – 5’ 8” tall but weighing 183lbs with a 43” chest. As a driver he joined the Motor Transport section of the Army Service Corps as Private no. M2/133441 and was posted to Grove Park in London the day after he enlisted. On 21 Feb 1916 he was declared unfit for service overseas as he suffered from chronic rheumatism – not uncommon in those days before antibiotics. However, his award of the British War & Victory Medals after the war indicates he had nevertheless been sent abroad; this is consistent with data in the Absent Voters List (AVL) of 1918 which states he was abroad at the time sometime outside of France or Belgium. The AVL also says he was in 707 MT Company which was at one time based in Thessalonica. That might also explain how he came to contract malaria in August 1916 for which he was awarded a 20% disability pension after the war. He was discharged on 23 April 1919 and returned briefly to Danebridge but by the time his wife Dorothy died in August 1921 he was back in Leigh working as a mechanic. 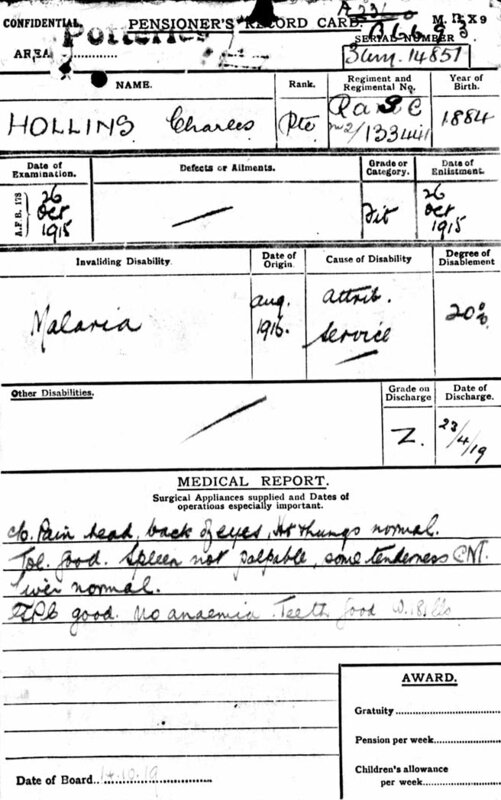 His army pension records show that he was examined regularly by military doctors until at least 1921 and continued to suffer from bouts of malaria every 6-8 weeks. Charles was married again in 1934, to Florence Hancock. In the 1939 register we find them both living on Uttoxeter Road is Stoke-on-Trent; he is still working as a motor mechanic and driver (for both petrol and steam vehicles) and she as pottery gilder. Charles acted as an ARP warden in Cheadle during the war. He died somewhere in the Staffordshire Moorlands in 1974 at the age of 90, outliving both his son (a bus driver) and grandson Frederick.